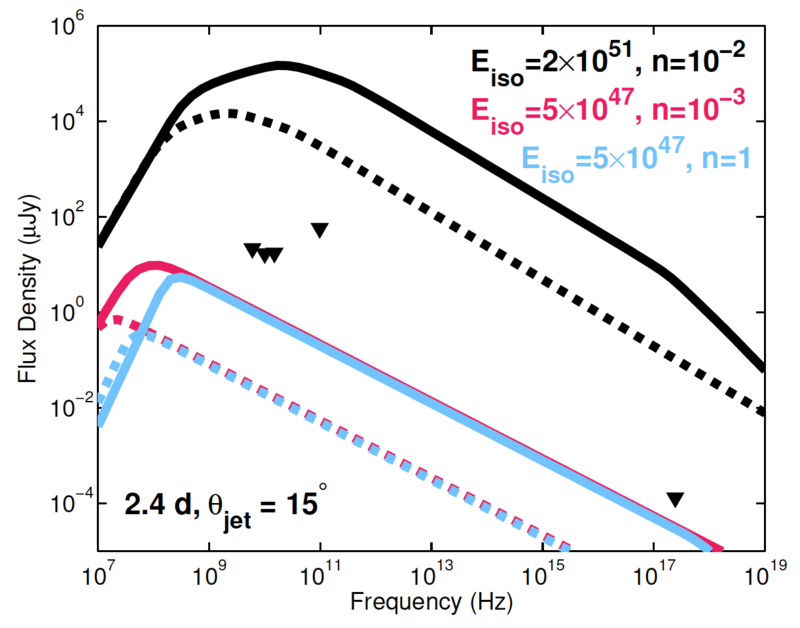 Radio SED take at 2.4 days after merger and the best-fit SGRB afterglow models. We present radio observations of GW170817 from the Very Large Array (VLA) and Atacama Large Millimeter Array (ALMA). Our data include the first radio observations of the electromagnetic counterpart at both the centimeter and millimeter bands, spanning 6 - 97 GHz. We detect faint emission at 6 GHz beginning at about 19 days after the merger, but we do not detect radio emission above 10 GHz. Our results rule out a typical on-axis jet from a short gamma-ray burst which would be several orders of magnitude brighter than what we observe. Instead, we find that the radio data, in conjunction with the X-ray light curve, can be explained by an off-axis relativistic jet, providing the first observational evidence for the launching of a relativistic jet from a binary neutron star merger. Finally, we point out that the deceleration of the kilonova ejecta should lead to a radio transient about 5-10 years from now!